I haven’t bought potato chips for a long time. There must be a potato chip out there somewhere that is made without soy, without hydrogenated oils, and without oils from crops that have been genetically modified… but I haven’t found any. Even the chips advertised as “fried in olive oil” have canola oil… or corn or soy… also listed in the ingredients. We don’t eat potato chips very often, but it’s one of the things we didn’t want to give up entirely. It took a while and was very much a process of trial and error, but I can now make homemade potato chips… “real” deep fried potato chips… that taste much better than any commercially made potato chips I have ever tasted. For “real” potato chips an inexpensive temperature controlled deep fat fryer is not a necessity, but it certainly does make the process a whole lot easier. The other necessary piece of equipment… unless you’re willing and able to slice potatoes paper-thin by hand… is a mandoline. An inexpensive mandoline will do the job well… and quickly… which is important if you’re making lots of potato chips for a crowd or a special event. Potato slices for potato chips must be paper thin. I use the thinnest setting on my mandoline, and the potato slices are almost see-through. It is also important to thoroughly rinse the cut potato slices, so I cut the slices directly into a bowl of cold water. I change the water once, drain the potatoes in a colander, and by the time the deep fat fryer has heated to the proper temperature the potato slices will be dry enough to fry. The reason for rinsing the potatoes is to get rid of excess starch and to prevent the potatoes from discoloring. Potato chips that are fried at a constant controlled temperature and drained immediately and thoroughly are not “greasy” because they have absorbed almost no oil. You can prove this to yourself by measuring the oil before and after frying a batch of chips. I have found that I can store my homemade potato chips if I seal them in plastic bags as soon as they cool from the fryer. I don’t have a vacuum sealer, but I try to get as much of the air out of the bag as I can and the chips will stay crisp and fresh for at least a couple of weeks. 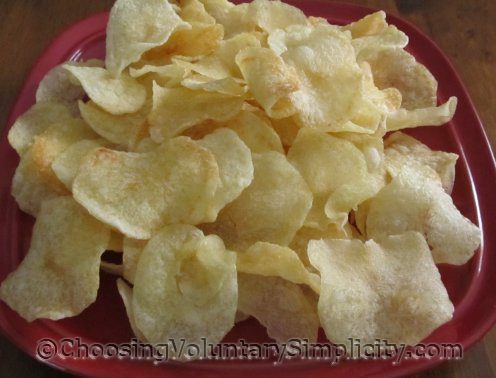 If you have never eaten a freshly-made potato chip, you have no idea what you have been missing! Those look AMAZING!! We don’t eat potato chips very often either but I know what you mean about not wanting to give something else up entirely. We’re constantly saying No to more and more foods and the way things are going I wonder where it will stop for people like us who either have allergies or who have concerns about what is in the food we eat. I appreciate learning how to make some of these things like real potato chips that I didn’t know could be made at home. Do you mind sharing the type of deep fat fryer you have? Also will the really inexpensive mandolines work for this do you think? I am so impressed with how your potato chips look. I really want to make some too but I am wondering if the inexpensive fryers and mandolines will work as well. THK… we have a Presto CoolDaddy Electric Deep Fryer. It has a lift-up basket and controls the temperature… we’ve had this for quite a while… the more expensive ones have more bells and whistles but this does exactly what I wanted it to do and does it well. The mandoline is this one, and that too has worked very, very well. I use this for a lot of other things as well.